In the name of 30, 000 Canadian Bosniaks in which many come from Prijedor, the Institute for Research of Genocide Canada seeks your support for the “Day of White Armbands in Canada”. The campaign "Day of White Armbands", whose aim is to fight for the rights and remembrance of Bosniaks and Bosnian Croats from Prijedor, occurs worldwide on May 31st each year. This campaign symbolizes the beginning of genocide perpetrated by the Bosnian Serbs and their supporters against Bosniaks and Bosnian Croats in Prijedor. In memory of innocent victims, the Institute for Research of Genocide, Canada once again draws the attention of the Canadian public to the ongoing denial of war crimes by Mayor Marko Pavic and his government. This was the first time since the 1939 Nazi decree that members of an ethnic or religious group were marked and prepared for extermination. Between 1992 and 1995, 102 children and 256 women were killed, a total of 3173 civilians perished, 31,000 people were detained in death camps, 53,000 people were victims of persecution and deportation. In just three months 94 percent of the Bosniak population from Prijedor was eliminated. Institute for Research of Genocide Canada would like to inform the Canadian political, scientific, cultural and general public on the current police ban on commemorative gatherings for victims. Additionally, local authorities refuse to permit the construction of a memorial for civilian victims in Prijedor at the former death camp, Omarska. 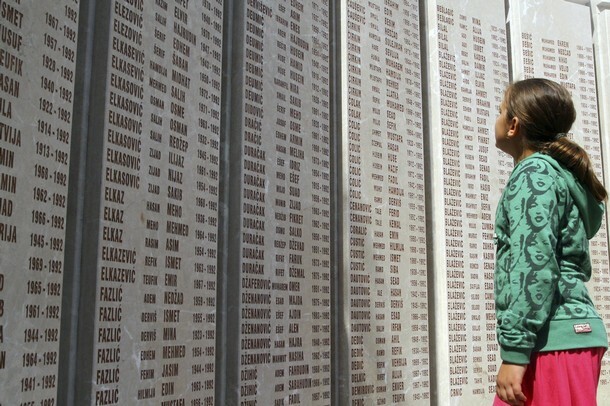 Last May 23rd, at the request of the mayor, the police in Prijedor banned the twentieth anniversary commemoration of 266 casualties of women and girls. On December 10th, 2012, Mayor Pavic banned a public gathering for Human Rights Day. On several occasions, ArcelorMittal prevented former detainees, foreign students and professors from visiting the former Omarska death camp. In June 2012, the Municipal Assembly of Prijedor passed a shameful and threatening motion which challenges the actions of activists in eight associations that make up the Committee for organization of the 20th anniversary commemoration. The Assembly requested a ban on any future commemorations for Bosniak and Bosnian Croats in Prijedor and prosecution of activists belonging to any victim organizations. Victims of the genocidal campaign carried out in Prijedor have not received any acknowledgement of their suffering from the municipal authorities to this day. Prijedor’s mayor Marko Pavic and the local government refuse to publicly acknowledge any of the crimes committed in the municipality, despite presence of numerous judgments by international and domestic courts. Memorials honoring victims of this campaign have been forbidden and access to sites of their suffering denied by the likes of ArcelorMittal, a company that now owns the site of the former concentration camp in Omarska. The Institute for Research of Genocide invites you to stand in solidarity with the victims of Prijedor through a public statement. We hope you can join us in commemorating “White Armband day” this May 31st. Let us stand up for justice together and remind the world that good will overcome evil and innocent victims will never be forgotten. For more information about the Day of White Armbands, please visit www.instituteforgenocide.org. We look forward to your response.